Derbyshire Dales residents will get an overview of the District Council’s spending plans for 2019/20 at a series of public meetings. 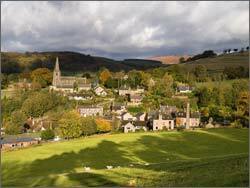 The next round of Area Community Forums will be staged next month in Matlock, Hulland Ward and Bakewell when local residents will be asked to give their views on options for the level of the District Council’s element of Council Tax bills in the coming year. A busy agenda will also feature an update on the procurement of a new waste and recycling contract, plus information about standing as a candidate at the District and Parish Council elections on 2 May this year. 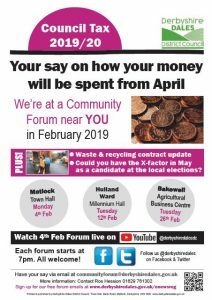 The forums take place at Matlock Town Hall on Monday 4 February, at Hulland Ward & District Millennium Village Hall on Tuesday 12 February and at the Bakewell Agricultural Business Centre on Tuesday 26 February. All start at 7 pm and anyone who can’t attend in person can email questions in advance to communityforum@derbyshiredales.gov.uk or via the District Council’s Facebook and Twitter pages @derbyshiredales.